Saint Finn will be the sole New Zealand runner tomorrow when he lines up on debut in the maiden event over 1600m at Matamata with leading jockey Mark du Plessis to take the ride. Coming off the back of a strong trial win at Rotorua, the regally bred son of Red Giant has shown good promise at home, although will certainly appreciated going over further ground as he progresses. 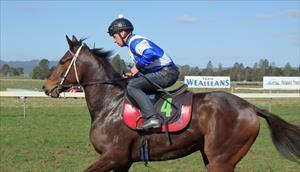 “He’s a nice type of horse with good quality about him and feels great under saddle,” co-trainer Chad Ormsby said.